In an “Interview on Interviews,” Andrés Jaque cites Harold Garfinkel’s theory of Ethnomethodology, which describes society as the product of a series of improvised social interactions – a method that places the individual as an actor at the center of social reality. This rhetoric of performance appears throughout this issue to describe the construction and reconstruction of certain urban and social conditions: spaces of research become just as much sites of production as of performance. The metaphor of theater provides a vocabulary for applied research that posits the city as a stage and the test-subject as a character – all of which, if we accept Lucía Jalón Oyarzun and Mateo Fernández-Muro’s notion of the architect as spatial minstrel and storyteller, assume fact to be composed rather than given. In this theater, where does the architect sit? What is the agency of each participant – architect, actor, or audience – in the composition, gathering, and delivery of these narratives? In what ways does performance reaffirm or complicate certain notions of subjectivity in relation to the test subject who emerges as a socially situated agent (even a biological and geological agent in Daniel Barber’s piece) in the production of new narratives and architectural knowledge? LABORATORY SERIES. No.04. 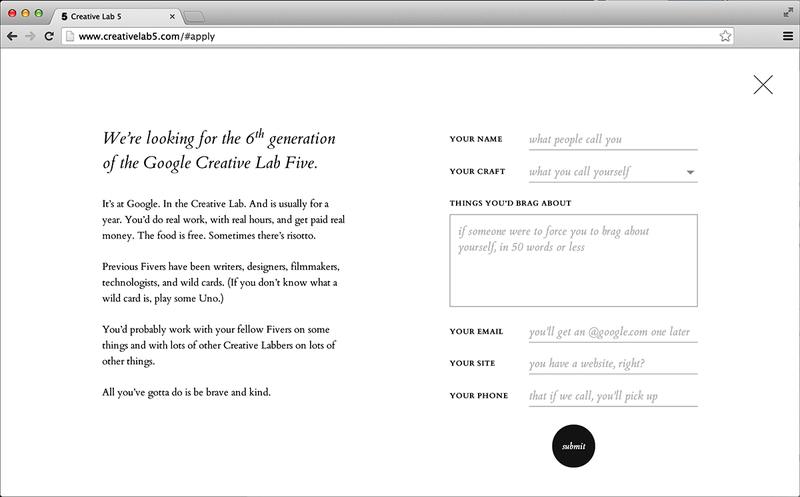 Google Creative Lab Five Application. Only the best and brightest need apply. The Creative Lab concept is simple: put a bunch of creative professionals together and separate them from the daily trappings of corporate clutter. Photo: Google Creative Lab Five.